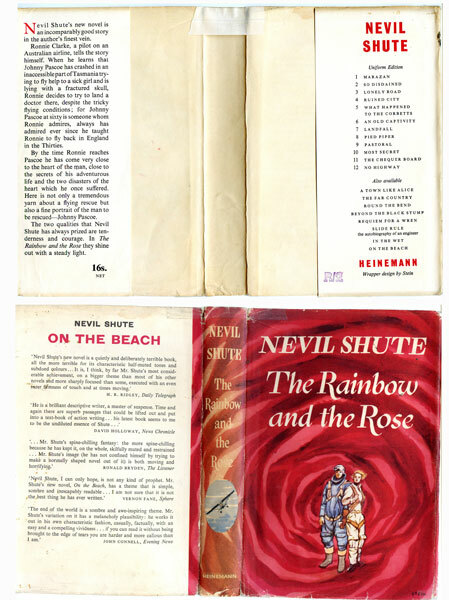 This is a First Edition of Nevil Shute's novel 'The Rainbow and the Rose' published by Heinemann in 1958. It is one man's three love stories (disasters of the heart) told from an air crash scene in an inaccessible part of Tasmania. The dust wrapper was designed by Stein and is over red boards with gilt lettering. Published by Heinemann in 1958. This would make a great gift. 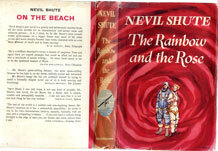 (We have other novels by Nevil Shute and First Editions). CONDITION:Very good condition with clean red boards and bright gilt lettering. Clean pages. The dust wrapper is in bright overall condition but is showing some shelf wear to all edges. However, it is not tatty.